Randall Fort, a former corporate officer with Goldman Sachs and program director at TRW’s space and defense groups, served as assistant secretary for intelligence and research in the State Department during the second term of George W. Bush’s presidency. The post included directing State’s in-house intelligence unit, the Bureau of Intelligence and Research (INR). Fort also served in a number of posts during the presidencies of Ronald Reagan and George H.W. Bush, including director of the Office of Intelligence Support at the Department of the Treasury and deputy executive director of the President’s Foreign Intelligence Advisory Board (PFIAB). Although not a vocal political advocate or pundit, Fort received some attention in early 2016 when Sen. Ted Cruz listed him as a foreign policy advisor to his presidential campaign, highlighting Fort’s service in the Reagan, George H.W. Bush and George W. Bush administrations. Randall Fort, on the other hand, was a Bolton proponent, reportedly writing a letter in support of the nomination during Bolton’s Senate confirmation hearing, according to United Press International. But the real concern was whether, under Fort’s directorship, the INR would continue to provide an independent and critical voice on intelligence issues. He had experience working for intelligence agencies; Fort’s 2006 appointment represented his second stint at INR, having served as deputy assistant secretary for functional analysis and research under Bush senior. He also served intelligence-support roles in Reagan’s Department of the Treasury and with PFIAB. Fort’s tenure at PFIAB overlapped with that of Gary Schmitt, a former executive director of the Project for the New American Century, who directed PFIAB from 1984 to 1988. During Fort’s tenure as head of INR, the agency attracted little attention nor did his work draw criticism from those who earlier had questioned his appointment. One highlight was Fort’s participation in preparing the “Annual Threat Assessment and U.S. National Security Challenges”—yearly congressional testimony delivered by the intelligence services. The testimony—which was given before the Senate Select Committee on Intelligence on January 11, 2007, by Director of National Intelligence John Negroponte; CIA Director Gen. Michael Hayden; Defense Intelligence Agency Director Lt. Gen. Michael Maples; FBI Director Robert Mueller; and INR Director Fort—was notable for the broad agreement among the intelligence officials that “the Iraq war had helped fuel Islamic radicalism around the globe and had most likely bolstered the recruiting efforts of al-Qaida,” as the New York Times reported. Before becoming assistant secretary at State, Fort parlayed his earlier government experience into influential posts in the private sector, working as director of global security at Goldman Sachs. That position entailed overseeing “all physical and personnel security measures,” according to Fort’s bio page at the Eisenhower Institute, a centrist policy think tank where he served as a board member before rejoining the State Department. Fort’s other past experience, according to the Eisenhower Institute, includes being “one of the first foreigners ever” to serve as an assistant to a member of the Japanese Diet; working on the staff of former Rep. Bill Gradison (R-OH); and being selected as a Henry Luce scholar. “Biography: Randall Fort,” State Department, http://2001-2009.state.gov/r/pa/ei/biog/72993.htm; “Executive to Lead State Dept. Intel Office,” UPI, June 12, 2006, http://www.upi.com/Business_News/Security-Industry/2006/06/12/Executive-to-lead-State-Dept-intel-office/UPI-58241150132346/?st_rec=2433464673600. “Biography: Randall Fort,” State Department, http://2001-2009.state.gov/r/pa/ei/biog/72993.htm. Randal Fort, “Biography,” Raytheon, http://www.afcea.org/mission/intel/documents/RandyFortBio.pdf. Barbara Slavin, “Critic Says Bolton a ‘Kiss-up, Kick-down Sort of Guy,’” April 12, 2005, USA Today, http://usatoday30.usatoday.com/news/washington/2005-04-12-bolton_x.htm. “Executive to Lead State Dept. Intel Office,” UPI, June 12, 2006, http://www.upi.com/Business_News/Security-Industry/2006/06/12/Executive-to-lead-State-Dept-intel-office/UPI-58241150132346/?st_rec=2433464673600. Joshua Micah Marshall, Talking Points Memo, June 13, 2006. Jonathan Landay, “Doubts, Dissent Stripped from Public Version of Iraq Assessment,” February 10, 2004, Knight-Ridder News Service, http://www.mcclatchydc.com/news/special-reports/iraq-intelligence/article24439789.html. Senate Select Committee, “Report of the Select Committee on Intelligence on the U.S. Intelligence Community’s Prewar Intelligence Assessments on Iraq,” Senate Report 108-301, July 2004, https://web.archive.org/web/20090305003321/http://www.gpoaccess.gov/serialset/creports/iraq.html. Mark Mazzetti, “The Reach of War: Shiite Radicalism Could Fuel Wider Violence, Official Warns,” New York Times, January 12, 2007, http://query.nytimes.com/gst/fullpage.html?res=9A0DEEDE1330F931A25752C0A9619C8B63. John Negroponte, “Annual Threat Assessment and U.S. National Security Challenges,” Statement for the Record to the Senate Select Committee on Intelligence, January 11, 2007, http://2001-2009.state.gov/s/inr/rls/79065.htm. David Wighton, “Bush Taps Goldman Sachs for Talent,” Financial Times (U.S. edition), June 9, 2006, http://www.ft.com/intl/cms/s/0/f50bf3b4-f818-11da-9481-0000779e2340.html#axzz43GqyZpWk. “U.S. Diplomacy Official Resigns,” BBC, June 19, 2006, news.bbc.co.uk/2/hi/americas/5095530.stm. 1. 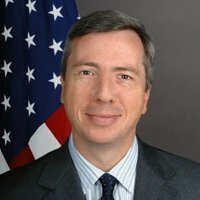 “Biography: Randall Fort,” State Department, http://www.state.gov/r/pa/ei/biog/72993.htm; “Executive to Lead State Dept. Intel Office,” UPI, June 12, 2006. 2. “Biography: Randall Fort,” State Department, http://www.state.gov/r/pa/ei/biog/72993.htm. 3. Barbara Slavin, “Critic Says Bolton a ‘Kiss-up, Kick-down Sort of Guy,’” April 12, 2005, USA Today. 4. “Executive to Lead State Dept. Intel Office,” UPI, June 12, 2006. 5. Joshua Micah Marshall, Talking Points Memo, June 13, 2006. 6. Jonathan Landay, “Doubts, Dissent Stripped from Public Version of Iraq Assessment,” February 10, 2004, Knight-Ridder News Service. 7. Senate Select Committee, “Report of the Select Committee on Intelligence on the U.S. Intelligence Community’s Prewar Intelligence Assessments on Iraq,” Senate Report 108-301, July 2004, www.gpoaccess.gov/serialset/creports/iraq.html. 8. Senate Select Committee, “Report of the Select Committee on Intelligence on the U.S. Intelligence Community’s Prewar Intelligence Assessments on Iraq,” Senate Report 108-301, July 2004, www.gpoaccess.gov/serialset/creports/iraq.html. 9. Mark Mazzetti, “The Reach of War: Shiite Radicalism Could Fuel Wider Violence, Official Warns,” New York Times, January 12, 2007. 10. John Negroponte, “Annual Threat Assessment and U.S. National Security Challenges,” Statement for the Record to the Senate Select Committee on Intelligence, January 11, 2007, http://www.state.gov/s/inr/rls/79065.htm. 11. “About the Eisenhower Institute: Randall Fort,” Eisenhower Institute, http://web.archive.org/web/20070415003928/http://www.eisenhowerinstitute.org/about/biofort.htm (Web Archive). 12. David Wighton, “Bush Taps Goldman Sachs for Talent,” Financial Times (U.S. edition), June 9, 2006. 13. “U.S. Diplomacy Official Resigns,” BBC, June 19, 2006, news.bbc.co.uk/2/hi/americas/5095530.stm. 14. “About the Eisenhower Institute: Randall Fort,” Eisenhower Institute, http://web.archive.org/web/20070415003928/http://www.eisenhowerinstitute.org/about/biofort.htm (Web Archive).